Hidalgo County Precinct 1 Commissioner David L. Fuentes and Weslaco Mayor David Suarez (center) prepare to cut the ribbon Wednesday commemorating improvements to Milano Road in Weslaco. 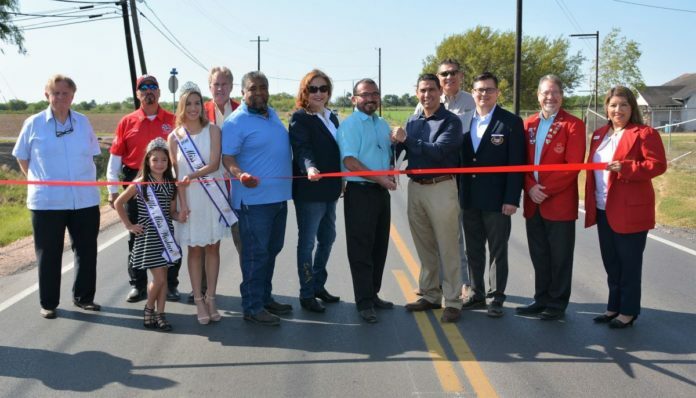 WESLACO — City and county officials stood on the newly paved portion of Milanos Road on Wednesday morning to commemorate its completion. An interlocal agreement between Hidalgo County and the city of Weslaco permitted the two entities to work collectively to reconstruct 1.7 miles of Milanos Road from U.S. Business 83 to 18th Street, in addition to a portion of 6th Street. The repairs had been in the works for more than a year. The $920,000 project that includes drainage improvements to alleviate flooding along the highly trafficked road runs through commission districts 1 and 4 and parts of the county’s jurisdiction. The city contributed $218,122.97 for materials. “We have so many people that have thanked us for getting this road done because it is a major corridor for the people that live here on the south side of Weslaco,” said Hidalgo County Precinct 1 Commissioner David Fuentes. Mayor David Suarez said the city received “a lot of complaints” about the road prior to the upgrades. “I commend all those who helped make this smooth stretch of asphalt including our city commission and staff and especially the leadership of Hidalgo County Precinct 1 Commissioner Fuentes and the entire staff,” Suarez, the chief of staff for the Precinct 1 office, said at the ceremony. The county and city will collaborate to repair Westgate Road from Mile 9 to Mile 11, Suarez said. The cities of Donna and Weslaco along with the county have also been moving forward with the repavement of a part of Midway Road.